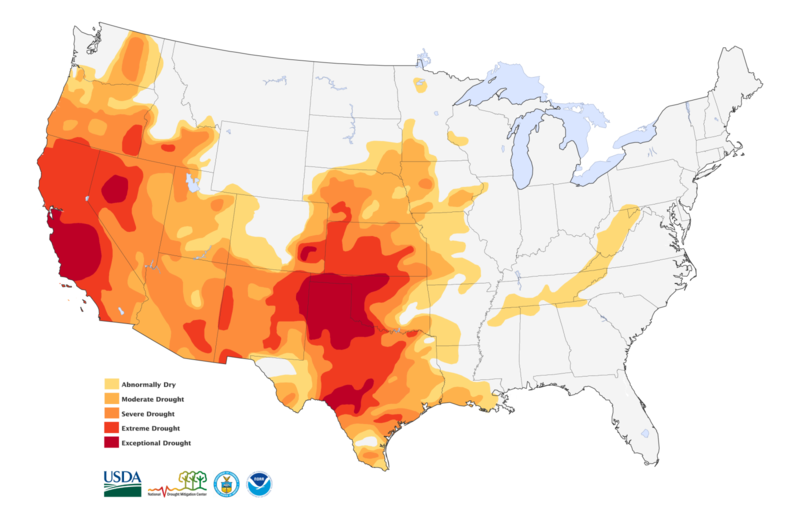 The U.S. National Drought Monitor reports that half of the United States is now experiencing drought - with nearly 15 percent of the nation gripped by extreme drought (see the >map below). The scale and severity of the drought is especially worrying. Another concern is the persistence of this drought, with droughts staying in force for longer and longer periods. The entire state of California is currently affected by extreme drought. This has a serious impact on the fruit and vegetable agriculture sector in California as well as for grains and livestock in the Plains and South Central West. It's expected that at least 54 percent of the U.S. wheat crop, 30 percent of corn, and 48 percent of cattle is affected by some level of drought. And in the east of the U.S. it's almost the opposite. A recently released report confirms that climate change is already impacting the United States. The number of extreme weather events, including very heavy rain events, has increased in the eastern parts of the nation. The number of extreme rain events has already increased over 70 percent in the Northeast. Are you experiencing any of this extreme weather? Another sad truth that is bringing many dangers and some of them are very hidden. In the soil of the Southwest of USA we can find the Coccidioides fungus. In dry months, the dust scatters in the wind and can be breathed into the lungs, infecting humans and animals. The incidence is rising dramatically in the Southwest, where reported cases increased tenfold from 1998 to 2011, according to the CDC (Centers for Disease Control and Prevention). Wow I was not aware of that. Thanks Mark! "Valley Fever is one of multiple diseases experts say are spreading in part because of climate change. They include a brain-eating amoeba showing up in northern lakes that were once too cold to harbor it and several illnesses carried by ticks whose range is increasing. [...] About 60% of those infected have no symptoms and never know they have it. An additional 35% have symptoms of fatigue and weight loss and typically miss "a few weeks to a few months of work" but get better, Thompson says. In about 5% of cases, the most extreme, the fungus finds its way into the bones, the brain or the skin, while other people fail to ever clear the organism from their lungs." Now that is horrible scary to imagine! You're right, it's a horrible fact. This should be enough to give climate change maximum priority but apparently this virus isn't spread enough to change things in a total way. 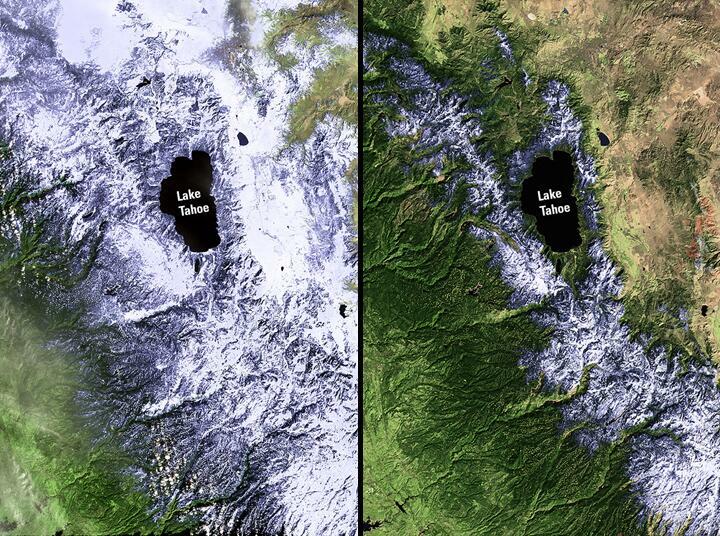 These >satellite images, of reduced winter snowpack in the Sierra Nevada mountain range, shows just how bad the drought in California is. The photo on the left is from February 23, 2011, and the photo on the right is taken on February 23, 2014. As a result of the drought, California is now facing large and dangerous wildfires. "This is unbelievable. This is extreme. This has gone from dry conditions to volatile conditions," said Paul Mendes, police captain of Carlsbad, California. But there are extreme weather events in other parts of the world as well. The Balkans are experiencing the worst floods in the region in 120 years - with 47 dead and whole towns evacuated. In Bosnia, Foreign Minister Zlatko Lagumdzija called the flood damage "immense" and even compared it to the destruction during the country's 1992-95 war, AJE reports.